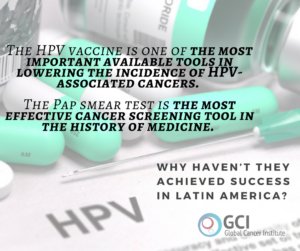 The GCI team recently published a scientific paper titled “An alert to Latin America: Current HPV vaccination trends highlight key barriers to successful implementation”, led by Dr. Angelica Nogueira-Rodrigues. In a previous article, we provided a look at the current status of HPV vaccine coverage in Latin America. This follow-up article will discuss the barriers to vaccination as well as a series of potential solutions. Limited knowledge about HPV and HPV-related diseases has been a barrier to achieving widespread vaccine uptake. Many parents remain in the dark; uneducated about the benefits of HPV vaccination. Some don’t even know that a vaccination exists, let alone that the vaccine prevents cancer. A study in Brazil revealed that less than 10% of participants had heard of the HPV vaccine. However, after being informed of its existence and potential benefits, 94% of participants reported that they would vaccinate themselves and/or their family members if given the opportunity. General practitioners serve their patients as trustworthy advisers, and if they promote and endorse the HPV vaccine, it is virtually guaranteed to boost adherence worldwide. Physician recommendation is an essential step in successful implementation of the HPV vaccine in low- and middle-income countries. Many parents also cite safety concerns as a main reason for declining to give their child the HPV vaccine. There is data to prove that these concerns are misguided. Over 200 million doses of the vaccine have already been distributed without negative effects, and the Global Advisory Committee on Vaccine Safety remains steadfast in its current recommendations. Longer vaccination appointments for parental education purposes could potentially dispel these safety concerns. This way, health care providers can be sure to inform worried parents on the safety of the vaccine, invalidating misconceptions and improving general acceptance. Physicians can also use a strategy called “bundling” where they approach the HPV vaccine as they would any other childhood vaccine. This would normalize its administration as part of the basic vaccine regimen that all children should receive. Both longer vaccination appointments and the introduction of the HPV vaccine among other commonly accepted childhood vaccines should work to combat the stigma surrounding the safety and efficacy of the HPV vaccine. High cost is also an important concern in many LMICs, due to the costs associated both with having to administer multiple doses of the vaccine and with delivering the vaccine to all of the target population. In fact, this problem has a readily available solution. The Pan American Health Organization (PAHO) offers the HPV vaccine to Latin American governments at one low price for all countries, regardless of how much a country would like to purchase or the how the country is faring economically. The HPV vaccine can be purchased through the Revolving Fund of PAHO for only US $8.50 per dose. With affordability of the vaccine under control, all that needs to be addressed is the lack of additional resources required for vaccine delivery to less accessible areas of each country. The farther away a community is from metropolitan areas, the less likely resources will be sent to this community. Extra finances are needed to reach rural and remote communities. The World Health Organization (WHO) has provided many countries with sustainable strategies to efficiently allocate their resources, but it is up to individual country to implement these strategies for the good of their constituents. Religious conservatism and the nature of HPV as a sexually transmitted infection have allowed cultural taboos to hinder communication and education about HPV. There is an unfounded belief that children who receive the HPV vaccine are more likely to become sexually active at a younger age. These culturally influenced attitudes deter parents from vaccinating their children, leaving them at risk for HPV in the future. However, studies show that there is no evidence of increased sexual activity or earlier sexual activity among vaccinated adolescents as compared to unvaccinated ones. It is the responsibility of the physician to communicate this information with religiously conservative parents. They must know that the loss of virginity and the fear of promiscuity are misguided and have no relation to HPV vaccination. In order to lessen the influence of cultural taboos in the medical world, health care providers have to properly administer and promote correct information regarding the HPV vaccine and its ability to prevent cervical cancer. Improving patient/provider communication is key in the promotion of the HPV vaccination. By properly monitoring uptake and adherence to the vaccine, countries can better evaluate national trends, drawing doctors and scientists closer to finding effective solutions for the cultural and socioeconomic barriers to HPV vaccine implementation.